With my inbox littered with Halloween party invites, I found myself uninspired to attend any of them. I find Halloween a dichotomous experience. On one hand it is fall, festive, excited happy children, and an opportunity to create and express. On the other hand, it is dark, bloody, and explores evil and frightening elements. Celebrating that which we shun on any other day. I also feel a unspoken pressure, probably self created, to be witty, clever, original, or just down right spendy and transform into...ta da! Whatever your- ta da- might be. I like to get dressed up now and then, and, I don't mind costumes, but my brain just doesn't think- I want to be a Care Bear- or Tina Turner! 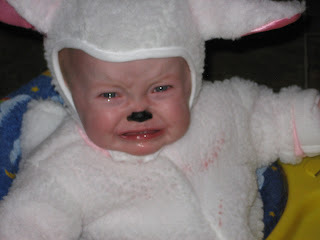 Call me unimaginative or cheap- but coming up with a Halloween costume is not my forte. Although, I truly appreciate others joy and creations. Some years I have donned a "costume", my version at least, and enjoyed making social appearances. This year, however, no dice. So I opted to spend the evening with family. Celebrating the night the old fashion way- trick or treating with children. And with who else? With nieces and nephews as cute as mine- who can resist? 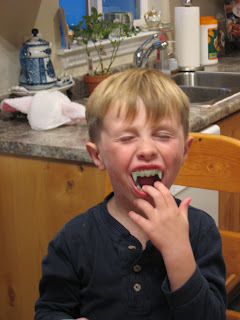 Jacob was given a pair of fanged teeth and they were his favorite. But he had to take them out to eat. 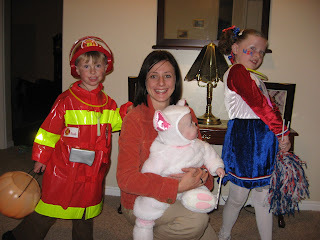 On our way out the door to hit up the neighbors for some candy- a photo with my favorite trick or treaters was a must! 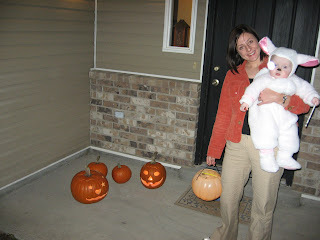 The lamb and I on our way with a view of expertly carved jack- o- lanterns. Heather Kenna was given a sucker at one of the houses. She played and played with it- until Mom noticed she had broken through the wrapper and was really enjoying it. This is her not so happy face because Mom took it away. We made a stop and David and Anginette's house where they were festive in their decorations. 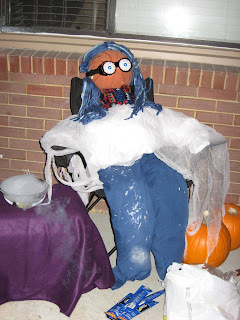 I loved this strange creature on their front porch. I loved watching the kids run ahead because they were so excited to get to the next house. Gaining more fuel at each stop to feed their sugar addiction. It was nice to have a night that wasn't about me. 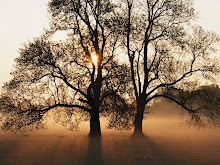 Just to enjoy family- spending precious moments together. It is a good reminder- family is what it truly important.